Let’s say you think that the next big thing will be commuting to work on a bicycle, drinking liquor in the morning, or, say, crochet. 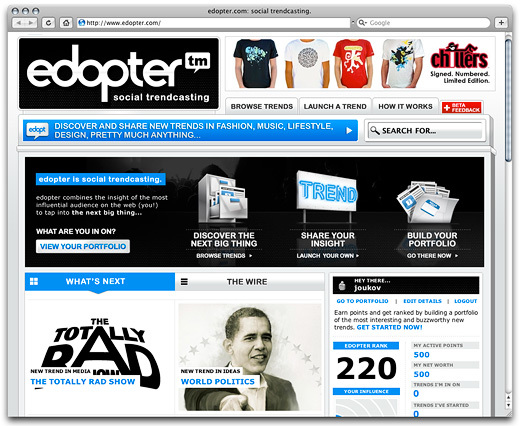 Now, thanks to the company One Blue Brick, there is a social trendcasting service tracking and guiding such trends: Edopter. These are the theories of Inner Mongolia, by Turbomilk designers. BTW, all icons are 100% vector; scale them all you like. To contribute to the overall beauty we picked a special angle: the viewer is looking from down below and feels all the power and monumentality of the icons. To make sure that our creations stay in line with the overall design of the site, we used grayscale and some blue hues in the palette (the main colors in the site). Visit the site to see for yourself how our icons fit right into the site’s design.